"This smoked trout schmear is incredibly easy, and very versatile. Obviously, it's great spread on any kind of bread or crackers, but slathered atop a freshly toasted bagel may be its finest expression." Place crumbled trout and softened cream cheese in a bowl. Add lemon juice, dill, chives, capers, horseradish, black pepper, salt, and cayenne pepper. Mix together with a fork until mixture achieves the chunkiness or creaminess you prefer. Transfer to a ramekin; wrap with plastic wrap. Refrigerate for 2 or 3 hours before serving to let flavors develop. 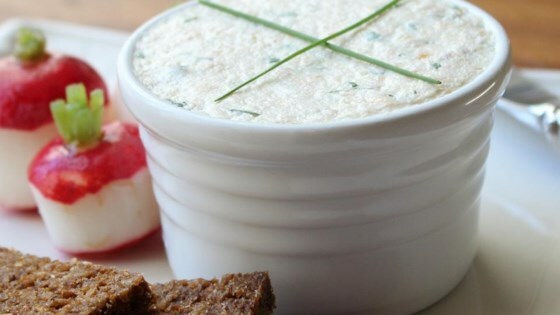 A delectable spread with cream cheese, smoked salmon, capers, and dill. The ideal amount of salt, acidity, and heat are very subjective. Equal proportions of cream cheese and smoked trout is a good starting point, but everything else should be added "to taste." This is amazing! Anytime I want something that will be delicious I look up Chef John recipes and go from there. I have never been disappointed. So simple to prepare. Flavour is excellent. Followed the recipe to the letter. Everyone at home loves it, either as a dip or on toast, even for breakfast! Love it and my guest did as well.